Prior to this review, I had unknowingly walked past the Pelican Cafe many times, usually on my way to Brewdog next door or Glasgow’s Kelvinhall. We were out in Glasgow to meet up with a couple of friends and decided to get some dinner in too. As the Pelican is located just seconds away from the bar, it was a no-brainer for us. I had heard many good things about their gold medal winning veal burger and I was looking forward to finding out if it was deserving of it’s award. As we sat down at our table, our drinks orders were taken straight away. I noticed that the Pelican offered several of my favourite beers on tap; however, when I asked for a pint of WEST’s St. Mungo lager, I was told that there was no draight beer available at all. We settled for bottles instead and decided to order our food. I spotted the gold medal winning Drumachloy Isle of Bute rose veal burger and knew I had to try it. Unfortunately, we were then informed that there was no veal left. Considering that the burger was advertised on a chalk board on the street (albeit on a lunch menu), I found this a little disappointing. I decided to go for the beef burger with added cheese and Pamela opted for the lamb and chorizo burger. 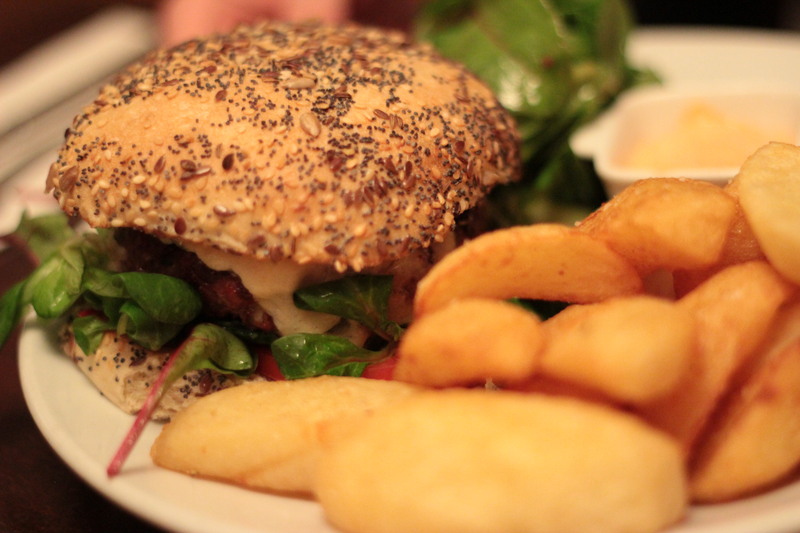 Our friend decided on the Scottish venison burger with added blue cheese for an extra £1. After roughly 45 minutes, we began to wonder where our food was. Waiting slightly longer on a Saturday evening is understandable; however, the cafe wasn’t exactly busy at the time. The burgers arrived shortly afterwards. Hopefully they would be worth the wait! As our burgers were brought to our table, my initial thoughts were that the presentation could have been slightly better and that the fries served with the burgers looked absolutely huge! I’ve had chunky fries before, but these were like whole potatoes! Wasting no time, we cut into the burgers to investigate further. 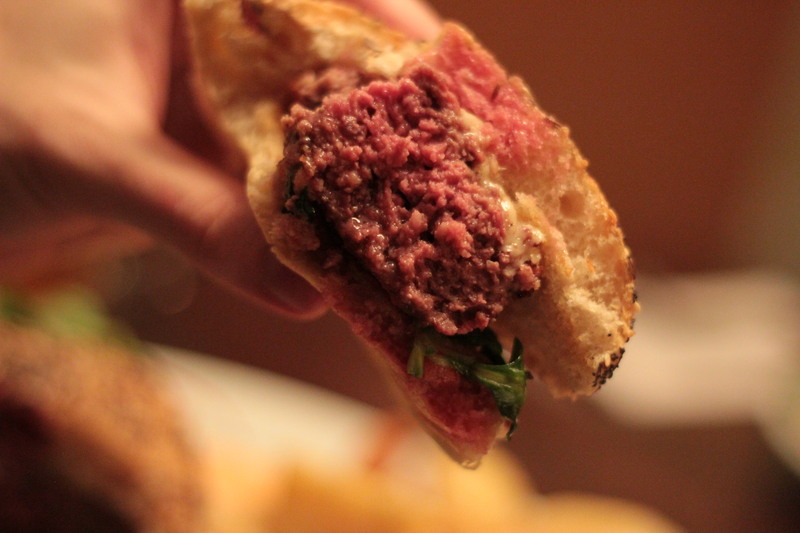 Inside the beef burger. Perfectly pink! 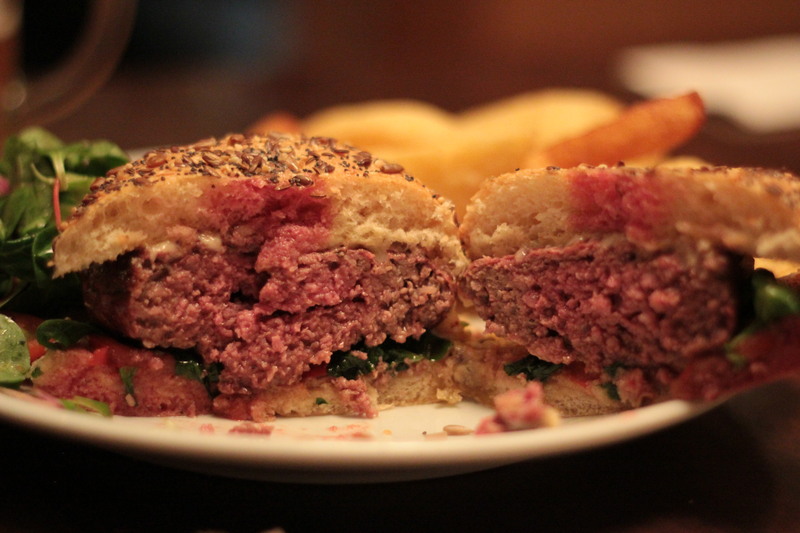 My beef burger, despite not looking the best in terms of presentation, was beautifully pink and juicy in the middle. It was perfectly cooked and had a wondeful consistency throughout the patty. Taste-wise, the patty itself was great. Juicy and full of flavour, the Pelican clearly use high quality ingredients in their burger patties. It was hard to fault the patty itself; however, I felt that the bun was lacking in terms of taste and presentation. The menu at the Pelican states that sourdough buns are used to make their burgers; however, personally I couldn’t tell whether it was a sourdough bread or not and overall, I felt it tasted like a basic poppyseed roll more than anything else. The cheese was melted perfectly on the burger and disappointing bun aside, the patty itself was incredibly tasty. 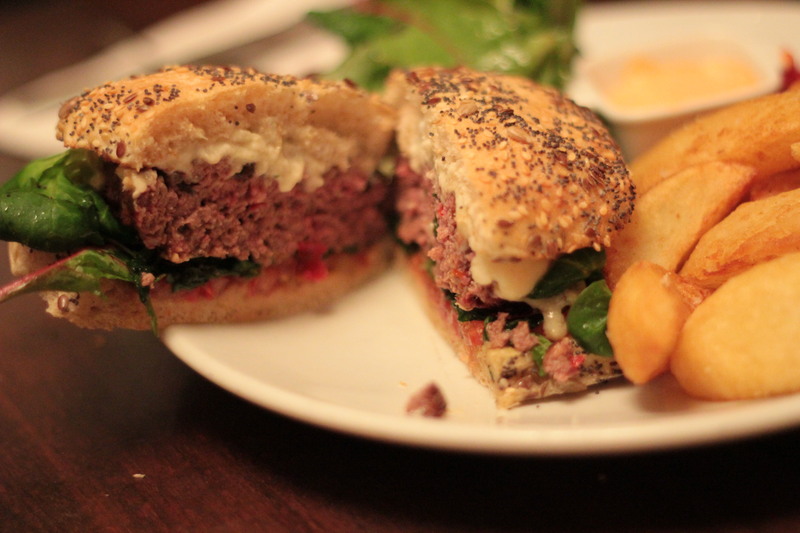 The lamb and chorizo and venison burgers were much of the same – great patty, disappointing bun. The lamb and chorizo burger really stood out, simply because the chorizo was minced through the lamb patty, which is a very rare thing to find. In my many years of eating burgers, normally when a burger is listed as ‘with chorizo’, it usually means that there will be a couple of slices of it on top of the patty. Not at the Pelican though! The chorizo was finely minced with the lamb and it gave off a wonderful, intense, bright red colour to the patty. Taste-wise, it was as good as the patty looked! The sharp, smokey flavour of the chorizo was a great contrast to the fragrant lamb and it was clear that the chefs didn’t skimp on the amount of minced chorizo that went into the patty, giving off a rich, intense aftertaste. 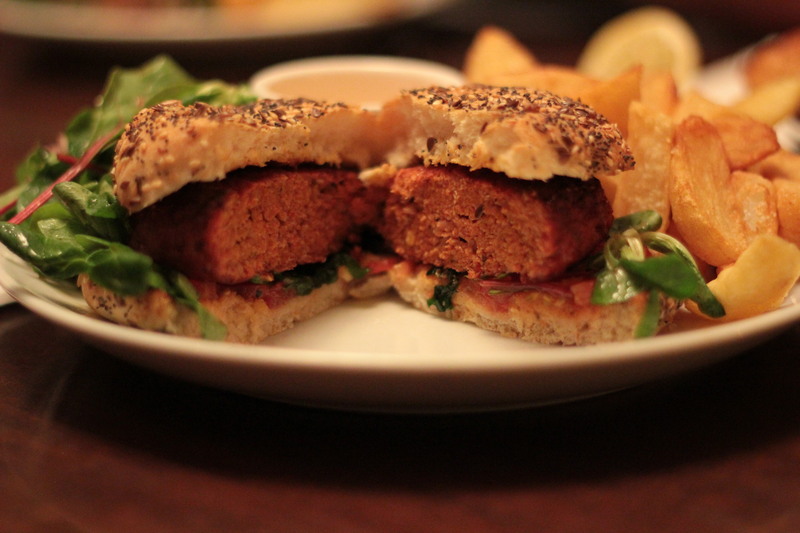 Inside the lamb & chorizo burger. Look how red it is! 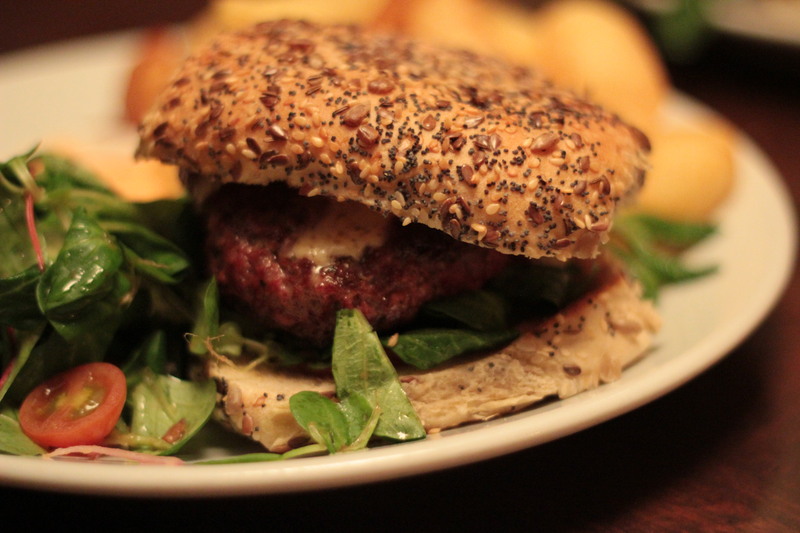 The venison burger had a slightly sweet, gamey flavour and was fairly tender – a nice surprise considering that venison can often be quite tough. The blue cheese added some extra depth to the patty, giving off a sharp, pungent taste which slightly offset the slightly sweet venison meat. Once again; however, I felt that the average burger buns used let this one down just a little bit. For the price, I felt that the burgers could have been a little bigger. The beef burger, which comes in at £10.50, isn’t exactly cheap for a plain burger. Yes, it was cooked near perfectly; however, when you consider other burgers that can be found nearby for less money, it may be a slight turn off to some. 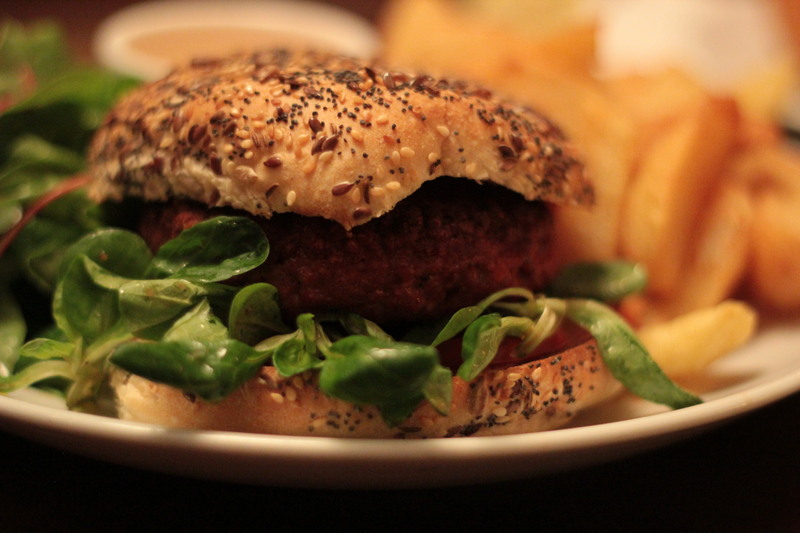 The lamb burger came with no cheese or other toppings – something that I’d normally expect for £11. I will; however, say that the chunky fries served with the food are not only absolutely huge, but taste great too. What tasted even better was the smoked paprika aioli mayo that comes on the side. It was so good that I wanted more bread just to rub around the sides of the mayo dish! Despite the slightly high price tag, the burgers themselves (not including the buns) were cooked and prepared perfectly and tasted great. I left the cafe feeling stuffed, but a little disappointed that I didn’t get to try the award winning veal burger. I enjoyed the experience overall and things like the minced chorizo, the perfectly cooked beef and tender venison were all high points. While I enjoyed my time at the Pelican, I also left feeling a little frustrated. There were simply a few issues I felt that, had they been different, I’d have been more keen to recommend it to friends and family. The great, perfectly cooked, flavoursome burgers were let down by the average buns and considering that we waited just over 45 minutes for the three burgers to arrive, the presentation was fairly standard. The Pelican is a good restaurant that simply needs to iron out a few issues which should be easily fixed. I’d go back again, simply to try the award-winning burger that I had planned to sample on this occasion. + Beef burger cooked perfectly. + Chorizo was actually minced through the lamb patty! 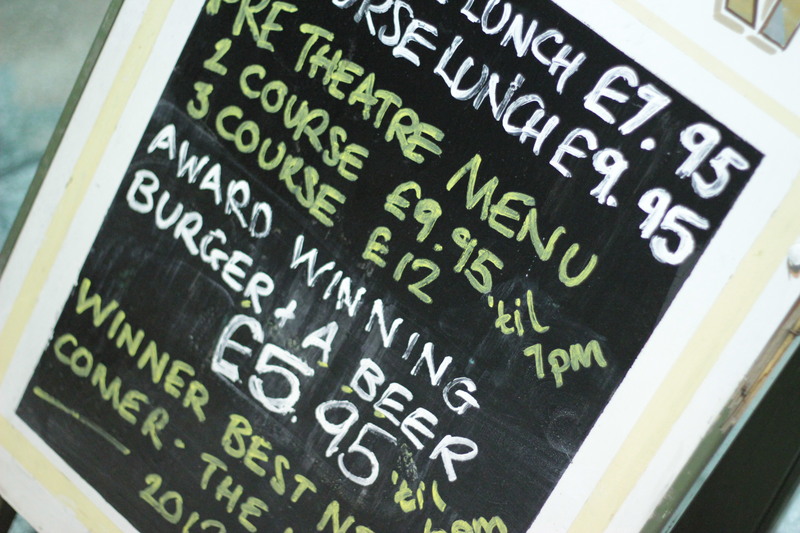 – Gold medal winning veal burger advertised outside on chalk board, but not available. – Overall presentation could have been better. – Service a little slow. I have eaten there on 4 separate occasions and every time I have been told there is no Veal. Perhaps they should remove it from the menu. I was also confused with the draught beer taps and agree about the bun.